So today is Pi Day. 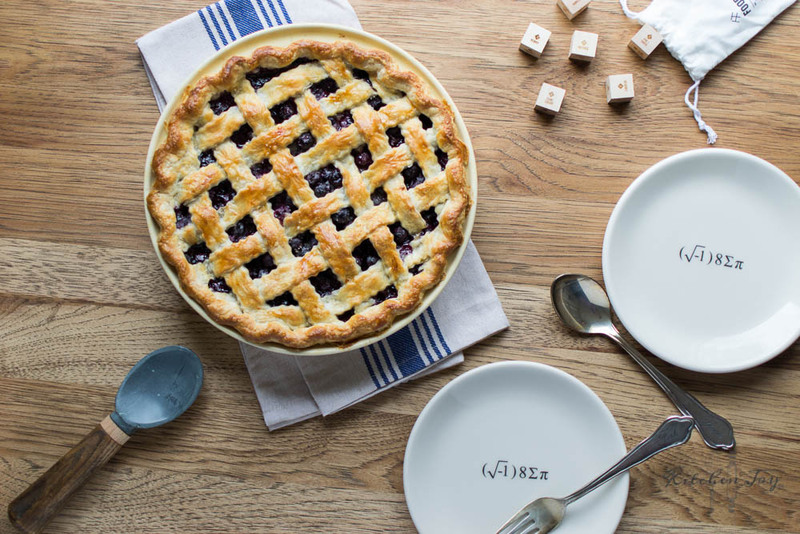 The nerdy holiday that encourages pie-eating in the name of mathematics. Sign me up. I don’t usually “celebrate” Pi Day, but this year we’re making a big deal of it for several reasons. First, I’ve been baking pies like a crazy lunatic for weeks in the name of research for a massive and exciting secret project, so honoring Pi Day just seemed like the obvious way to end our recent pie adventures. Second, because I participate in Food52’s Cookbook Club and the book for the month of February was Art of the Pie by Kate McDermott. 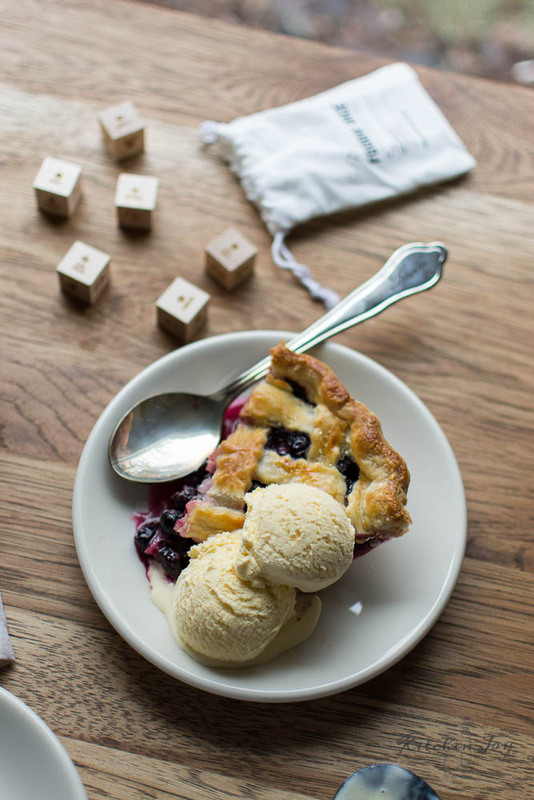 That book is a full-blown love letter to pie in cookbook form. 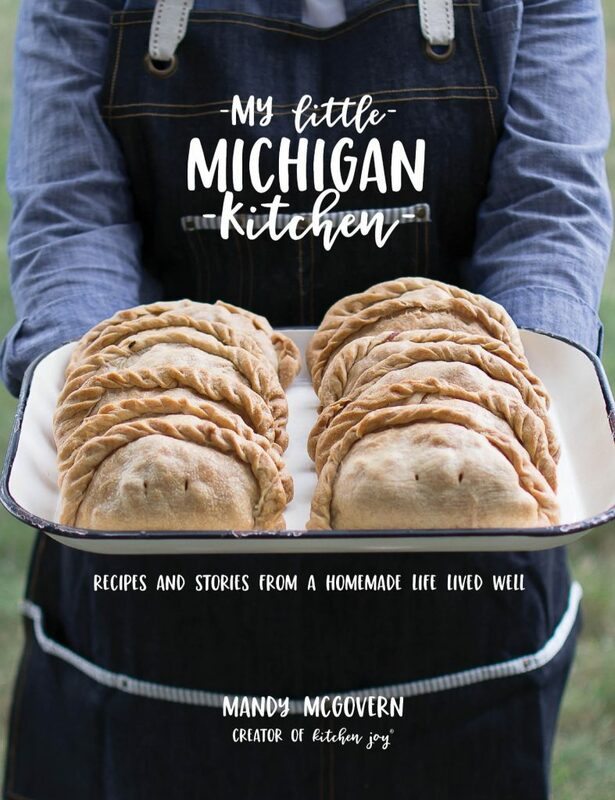 Inspiring and charming, Kate shares her wealth of pie knowledge with her readers, and exemplifies her dedication to the craft by way of her “Pie Cottage”. 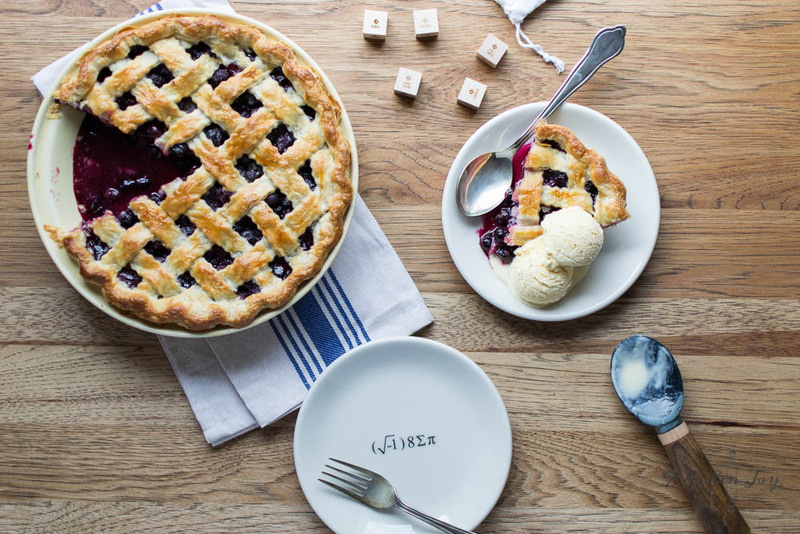 The most adorable little pie-centric home you ever did see. Third, and certainly most personal, because I have postpartum depression. I gave birth to our hilarious, smiley, always-wiggling little girl 9 months ago and she is truly the daughter every mama dreams of and hopes for. She is an answer to the prayers of so many people who love us. You see, we lost our first baby to a miscarriage almost 2 years ago. 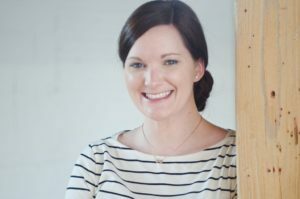 There were no guarantees that we could or would ever have our own children, and after being married for a decade, you can imagine that I was asked “When are you guys having kids?” all the time. It was a tremendously difficult time. Fast forward to when our daughter was born, we were in joyous disbelief. She was (and is) perfect in every way. She brings complete, all-consuming joy to my life. At the same time though, there is a dark cloud that just won’t go away. It’s an all-consuming sort of melancholy that makes absolutely no sense. What do I have to be depressed about? Nothing. Why do I cry over silly things or for no apparent reason at all? I wish I knew. What I do know is that hormones are no joke and that I didn’t get any relief until I sought out help from my doctors. It is still a daily battle, but these days there are more good days than bad. My real reason that I’m celebrating Pi Day is because even though the cloud hasn’t lifted completely, I don’t live every day in fear of my feelings. This week, my husband is traveling to China on a business trip, so it’s just the little lady and I around here. I decided that I wanted to take a little trip with her, so we’re spending a few days in Detroit doing a bit of a food crawl to check out several places I’ve been wanting to try for ages. Not the least of which being Sister Pie. So, for Pi Day this year, Addilyn and I are making a pilgrimage to Sister Pie, enjoying some salted maple pie for the occasion. A month or two ago I would NEVER have voluntarily gone on a road trip and stayed in a hotel all by myself with her, but now I feel prepared to handle and enjoy whatever happens on our little adventure. Life is getting brighter and that is definitely worth celebrating. Last, and probably the most fun reason to celebrate Pi Day this year is because the food nerd in me just had to put good use to my nerdy pie accessories. I recently got the most fantastic pie plate and pie serving plates that have equations on them that translate to: “i eight sum pi”. 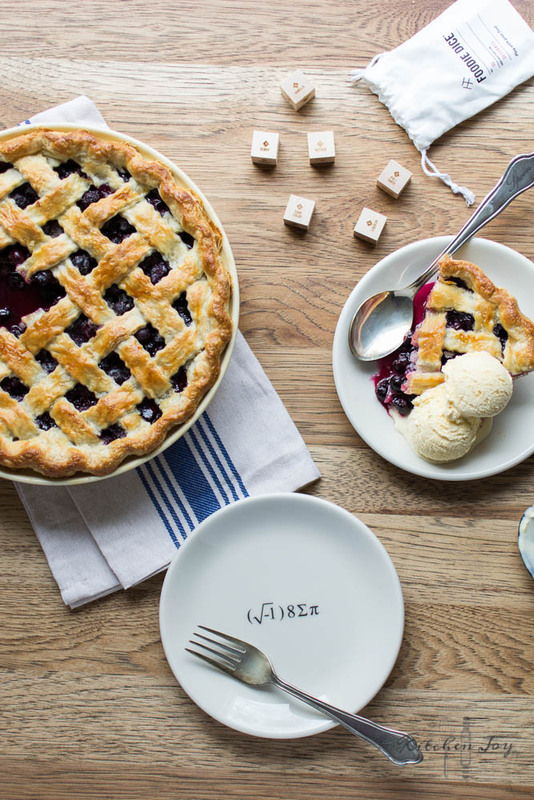 Seriously, perfect for Pi Day, and every day. They’re also made in USA, which is a huge priority at our house. In fact, the pie plate is made by Fiesta, and it bakes beautifully. I also received some Foodie Dice that when rolled will tell you what type of dessert to make. Way more fun than Yahtzee! Basically how they work is you roll the dice, and bake according to the ingredients that you roll. Mine is the Dessert edition. For today’s recipe, I rolled: 1. Pie/Tarte, 2. Cane Sugar, 3. Berry, 4. Vanilla, 5. Nutmeg, 6. Liqueur. I decided to do a small variation on my usual Blueberry Pie recipe, and the results were delicious. I left out the cinnamon and the cloves, and added 1 tablespoon of Cointreau orange liqueur. I don’t typically include liqueur in my blueberry pie recipe but the dice told me to, so I used some Cointreau that I had in the cabinet from another recipe and the brightness of the orange flavor complemented the blueberries really well. Kate McDermott uses Cointreau in a lot of her pie recipes, so I was pretty sure I wouldn’t have any regrets. If you’re wondering where I got all of my cute pie-themed goodies, they’re all from Uncommon Goods. Based in Brooklyn, NY, they offer a huge variety of super fun, unique, and quirky gifts and decor items. The majority of their products they carry are USA made, handmade, and/or made from recycled materials. I love browsing through their site because they always have things that I think would make great gifts, and since their items are so unique, you can pretty much guarantee that the recipient doesn’t already own it. 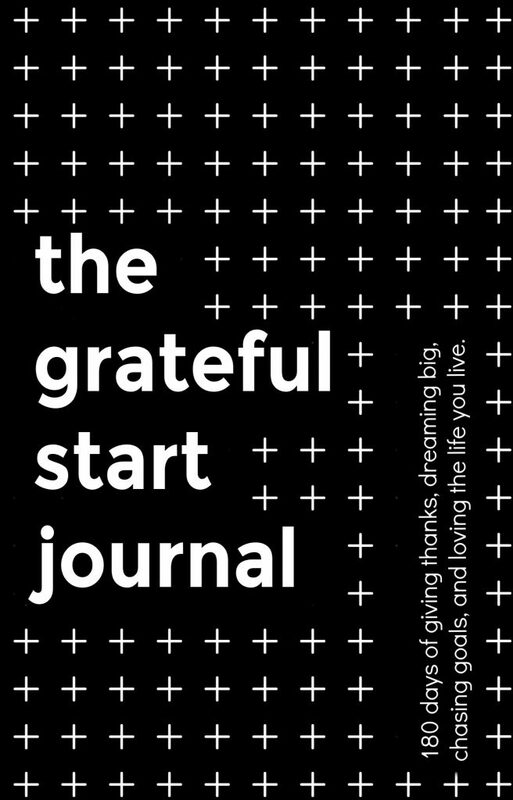 (Heads up: Mother’s Day, Father’s Day, and all of those really difficult-to-shop-for holidays are coming up before we know it…You might want to check out their site and go ahead and make a secret Pinterest board to organize all of your clever finds…I might know someone who does that.) I confess I want all the kitchen things for myself… And most all of these geeky gifts are kind of perfect for my husband. I hope you all are able to have yourselves some pie this week, and find something to celebrate. Thank you for letting me share things that are hard to talk about. If you are also struggling with postpartum depression, please please consult your doctor. Find someone to talk to who you can trust. Don’t blow it off. I have a friend who has been through this before and she saw the warning signs in me and she persuaded me to get help and seek out some relief. I am forever grateful to her. You are not alone. You are not a bad mother just because your emotions are out of control. It will get better. **A big thank you to Uncommon Goods for providing me with the items featured in this post in exchange for my review. All opinions are my own.